Let’s continue talking about methods of education. Part 1 brought us three major methods and today we look at the last four. Remember, the philosophy and method of education will dictate the curriculum. If they don’t match, it’ll make mama unhappy. And nobody wants that. Unschooling This method is directed by student interest and teachable moments. Teaching methods vary as to what works for the student. Unschooling is often confused with not schooling, when actually it strives to make the most of teachable moments and seasons involving intentional teaching and modeling. Subjects are taught when the student requests or is interested in learning the subject. Teachers introduce different ways to glean the information or skill. Creating an environment of natural learning and study as well as a spirit of independence are key marks of unschooling. There are variations of unschooling and, just like other methods, some subjects are unschooled while others are handled differently (this is decided by the family). Variations are often called relaxed homeschooling, delight-directed education, or interest-led learning. Curriculum that fits the Unschooling method fully: No such thing since it is learner dependent. 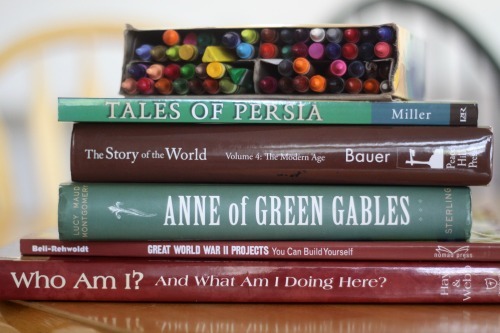 Curriculum that incorporates aspects of unschooling: Pretty much everything because anything can be used if the student finds it engaging and helpful. Montessori The Montessori method is a structured method that involves prepared environments where students use all their senses to explore, discover, and learn in individual and group activities. The method was developed by Marie Montessori as she scientifically studied children in the early 1900s. Long periods of uninterrupted learning, individualized plans, work centers, interwoven subjects, and portfolios are trademarks of this method. Further reading: Montessori and Homeschooling: Here to Stay? Unit Studies This method involves centering all studies around a central theme so that the subject is learned in depth. Every subject is taught in connection to the specific unit, medieval times or bees for example. The units are often child directed, but not always. A variety of hands on activities are used to engage the student and studying the unit from different aspects is involved. Some unit studies incorporate all subjects but math in the unit. Many times specific curriculum is not used, but books, videos, field trips, and more are planned around a theme and organized by the parent. Eclectic This method is pretty much what the name states: it’s a combination of different methods. Not a purist for any one method, the user picks and chooses a little from a couple, or several, or many. This combining choice could be due to many factors, including parent preference, student preference, or life circumstances that dictate choices. Curriculum that fits the Eclectic method: Could be any of them since the user picks and chooses. 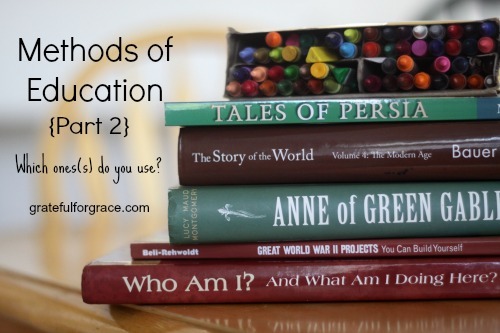 Curriculum that fits many aspects of the Eclectic method: Again, just about anything. So…. there ya’ go: the major methods of education and some curriculum that corresponds. Which ones do you like? use? wish you had been involved in when you were growing up? Can you guess which one(s) I use? What do you find interesting about methods of education?